A Fitzwilliam convenience store has given £1,000 to the Yorkshire Air Ambulance to help with its running costs. The Nisa Local, on Wakefield Road, donated the funds through Nisa’s Making a Difference Locally charity. The Yorkshire Air Ambulance is an independent charity that needs to raise £12,000 per day to keep both of its rapid response helicopters maintained and in the air. The YAA, which is based at National Trust Nostell, currently serves an area with around five million people and attends more than 1,200 missions a year. 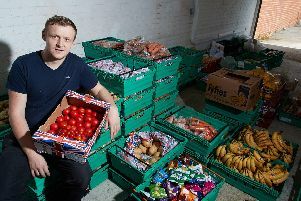 Josh Cordon, store manage, said: “We’re really proud to support this amazing cause, which is based just two miles away from us and provides a valuable service to the area. “The Yorkshire Air Ambulance is something that any of us could need one day and we know it has already helped a number of our customers in the past. Making a Difference Locally (MADL) raises funds when customers purchase items from Nisa’s Heritage own-label range and a number of branded products, highlighted with the MADL logo in store, which carry charitable donations from the suppliers. Funds can then be donated by the store to a local charity or good cause within a ten mile radius. For more information, visit www.makingadifferencelocally.com or follow the charity on Facebook and Twitter at @MADLCharity.